Ah, screw it. The Penguins' power play looks awesome! I mean, are you kidding me with some of this? 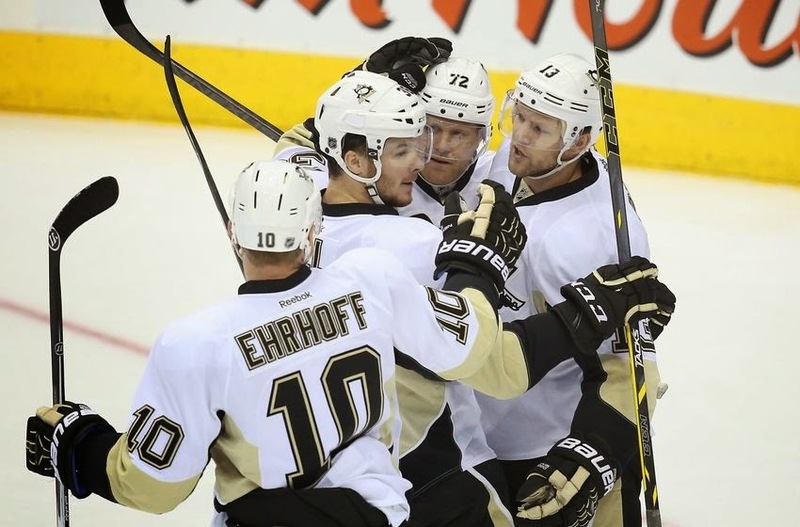 The Pens have scored eight power play goals over 17 opportunities for a 47 percent (!!!) success rate. On Saturday, scoring two power play goals in the span of one minute turned the tide and led to Pittsburgh's victory over the New York Islanders. So as much as I want to advocate for Pens fans to be cautious in their optimism and let the work of Mike Johnston and Rick Tocchet play out, I can also safely say the team's power play will be (to use a technical term) super awesome. Let's work under this assumption -- the Penguins' power play, which was the best in the league at 23.4 percent last season, will score on at least 20 percent of its man-advantage chances this season. Doesn't sound too far-fetched. Then these are the questions I want to explore: How much does it help to have a 20-percent-or-better power play, in both the regular season and the playoffs? Can an elite power play alone win you a Cup, or do you need more? Believe me, it certainly doesn't hurt to have a team that can strike at least one of every five times it is on the advantage. A great power play would strongly indicate a team that can also score often in even-strength situations. But let's keep it simple and just look at the overall performances of these top PP's. One side note: I prorated teams' power play totals, win totals and point totals from the lockout-shortened 2013 season. For example, the San Jose Sharks' totals (34 goals, 169 opportunities, 25 wins, 57 points) were prorated to a 82-game season as 58 goals, 288.5 opportunities, 42.5 wins, 97.5 points. 18 had a positive SRS (Hockey-Reference's Simple Rating System. Think "positive = above average, negative = below average"
Okay, there is a lot to digest there. Let me draw your eyes to a few interesting/surprising results. 1. Of the teams with the 18 best power-play units since the cancelled season, none won the Stanley Cup. I'm hoping the following statement is not too controversial: winning the Stanley Cup is a very difficult task. WHOA, CALM DOWN! I mean, it's a teensy-weensy bit hard. That said, it surprised me that exactly zero of these teams with super-elite power plays were able to raise Lord Stanley's Cup. Think about some of these fantastic squads: the 2007 Sharks (22.4% power play, 0.77 SRS), the 2009 Bruins (23.6%, 0.89), the 2011 Canucks (24.3%, 0.89) the 2013 Penguins (24.6%, 0.91)... all great, no Cups. Now that leads us to a controversial conclusion: it takes more than an awesome power play to win a championship. HOLY MOLY, JUST RELAX! I mean, it takes just a little more than that. Just a smidge. 2. Though it is a good idea to draw penalties, it does not automatically translate to points in the standings. For this exercise, I am wiping away the 2006, 2007 and 2008 seasons (in which refs were handing out power plays like desperate job-seekers hand out business cards), as well as the shortened 2013 season (in the realm of "variance trumps all," it is easier to keep up a 20% PPG rate in a 48-game season than in an 82-game season). Okay, that leaves us with 17 teams with elite and super-elite power plays. 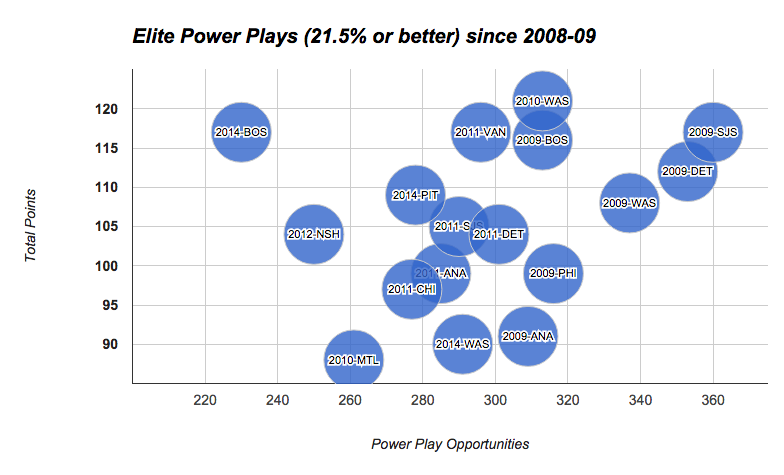 Below I chart their total power play opportunities and total points in the standings. The correlation of the two was 0.26, which means that being an elite power-play team that draws more penalties correlates with a better spot in the standings, but not so much so that it makes "get those other dudes into the sin bin!" a legitimate strategy. Basically, if you have a great power play, you probably have a great team (14 of these 17 teams finished with at least 97 points in the standings). Play your game and let the man-advantages come to you. 3. Are you looking for records? The magic number is 25.5. The 2009 Detroit Red Wings hold the new-millennium record for best power play in an 82-game season. The Wings scored 90 goals in 353 man-advantage opportunities, good for a 25.5% success rate. Detroit went on to win 51 games and total 112 points for the No. 2 playoff spot out West. The Wings had an elite power play, and it was balanced too: Henrik Zetterberg, Pavel Datsyuk, Johan Franzen, Marian Hossa and Nicklas Lidstrom all scored between 10 and 12 power-play goals in the regular season. Detroit continued to slice through short-handed opponents in the playoffs, scoring 23 goals in 97 opportunities for a super-elite-level 23.7 percent success rate. And it was all almost enough to win it all... until Marc-Andre Fleury made 25 saves on 26 shots as the Penguins survived Game 6 of the Cup Final then made 23 saves on 24 shots in Game 7 to return the Stanley Cup to Pittsburgh. It is tremendous to have a top-flight power play. But if you're a fan of such a team with designs on the Cup, never forget the Law of the Hot Goalie.